04/16/2019: Implemented uber-cool folding table for catalog resources. 04/15/2019: Implemented scaling images, first step for responsive design. 04/03/2019: Added a X-Circle  1/2x9/16 Short Offset Box Wrench. 04/02/2019: Added a Super-Quality  1/2x9/16 Short Box Wrench. 03/31/2019: Added a Duro-Chrome 4571 1/4-Drive Handle and a Handy-Hex 02053 5/8x11/16 Offset Box Wrench. 03/30/2019: Added a Handy-Hex 02055 13/16x7/8 Offset Box Wrench and a Duro-Chrome 2057 1-1/16x1-1/8 Offset Box Wrench. 03/29/2019: Updated section on Duro box-end wrenches, added an Indestro Super 730A 7/16x1/2 Offset Box Wrench. 03/26/2019: Added an Indestro Polygon 1/2x9/16 Offset Box Wrench. 03/24/2019: Added a Super-Quality 732 5/8x11/16 Offset Box Wrench and an Indestro Polygon 3/4x25/32 Offset Box Wrench. 03/22/2019: Added a Duro 1/2-Drive Sockets from 23-Piece Set, a Super-Quality 711 3/8x7/16 Box Wrench, and a Super-Quality 714 11/16x25/32 Box Wrench. 03/21/2019: Added an Indestro Polygon 13/16x7/8 Offset Box Wrench and a Super-Quality 734 13/16x7/8 Offset Box Wrench. 03/20/2019: Added a Duro 1/2-Drive 23-Piece Socket Set. 03/19/2019: Added a Duro 1/2-Drive 6-Point Socket. 03/18/2019: Updated catalog resources with Western Auto listings. 03/17/2019: Added a catalog listing to the tool identification section. 03/14/2019: Added a Catalog Listing for Duro 42-Piece Socket Set. 03/13/2019: Renumbered figures, added an Indestro "Chicago" [No. 922] Box-End Wrench and an Indestro "Chicago" [No. 925] Box-End Wrench. 03/12/2019: Added Indestro 1/2-Drive Sockets from 13-Piece Set. 03/09/2019: Added Patent #1,904,328, updated history to estimate Duro-Indestro merger in mid 1933. 03/08/2019: Added an Indestro "Chicago" [No. 925] Box-End Wrench. 03/07/2019: Added an Indestro 1/2-Drive 13-Piece Socket Set, an Indestro 1/2-Drive Lever-Action Ratchet, and an Indestro "Select Steel" 3/8x7/16 Offset Box Wrench. 03/06/2019: Added an Indestro "Chicago" No. 33-B Open-End Wrench and an Indestro "Chicago" [No. 921] Box-End Wrench. 03/05/2019: Added an Indestro "Chicago" 9/16x5/8 Open+Box Wrench and an Indestro "Select Steel" 5/8x11/16 Short Box Wrench. 03/04/2019: Minor update to Indestro history. 03/03/2019: Added an Indestro "Chicago" No. 729 Open-End Wrench, an Indestro "Chicago" 5/16x7/16 Open+Box Wrench, and an Indestro "Chicago" 9/16x5/8 Open+Box Wrench. 03/02/2019: Added an Indestro "Chicago" No. 733 Open-End Wrench and an Indestro "Chicago" 5/8x3/4 Open+Box Wrench. 03/01/2019: Added an Indestro "Select" 5/8x11/16 Offset Box Wrench. 02/28/2019: Added Indestro 3415 Battery Pliers. 02/27/2019: Added an Indestro [No. 641] Ell Handle and Indestro Sockets from No. 1518 Set. 02/26/2019: Added a Duro 624 Socket Wrench, an Indestro [No. 655] Ratchet, and an Indestro T-L Tee and Ell-Handle. 02/25/2019: Added "Klip Tite" trademark and a Duro 633 Triple Socket Wrench. 02/24/2019: Added an Indestro No. 1518 1/2-Drive Socket Set, an Indestro "Chicago" 5/16x7/16 Open+Box Wrench, and an Indestro "Chicago" No. 29 Open-End Wrench. 02/23/2019: Added an Indestro No. 350 Socket Set and an Indestro No. 360 Handle and Socket Set. 02/21/2019: Added a Duro 621 Socket Wrench, an Indestro No. 659 1/2-Drive Sliding Tee Handle, a Handy-Hex 273 Head and Manifold Wrench, and Duro-Chrome No. 2126 Brake Spring Pliers. 02/20/2019: Added a Duro 631 Socket Wrench and an Indestro No. 1513 1/2-Drive Socket Set. 02/18/2019: Added new photos for Indestro No. 220 1/2-Hex Drive Socket Set. 02/17/2019: Added illustration of Duro factory, updated photo for Indestro No. 19 1/2-Hex Drive Socket Set. 02/16/2019: Added an Indestro No. 28 1/2-Hex Drive Socket Set. 02/15/2019: Added a Duro 1/2-Hex Drive 16-Piece Socket Set. 02/14/2019: Added an Indestro No. 3211 1/2-Drive Extension. 02/13/2019: Added a ChromeXQuality N694 1/2-Drive Socket Set, an Indestro [No. 3202] Ratchet, and an Indestro No. 3206 Sliding Tee Handle. 02/11/2019: Added ChromeXQuality 1/2-Drive Sockets. 02/10/2019: Added 1923 notice for Sure Seal Bottle Capper Company. 02/09/2019: Reorganization mostly complete, figures renumbered. 02/08/2019: Streamlined tool identification section, organization getting better! 01/28/2019: Minor edits to history, added an early catalog listing for an Indestro socket set. 01/24/2019: Added a Duro-Chrome 2058A Offset Box-End Wrench. 03/13/2016: Added a Super-Quality 733 Offset Box-End Wrench. 02/10/2016: Expanded description for No. 1236 set. 02/03/2016: Added a Super-Quality  Short Box-End Wrench and a Indestro Super 731 Offset Box-End Wrench. 02/02/2016: Reorganized alloy wrench section, added a Super-Quality 731 Offset Box-End Wrench. 01/27/2016: Added a Duro-Chrome 2081 Box-End Wrench. 01/22/2016: Added a Duro-Chrome 2015 Box-End Wrench. 01/04/2016: Added a Ward's Master Quality 1/2-Drive Ratchet. 01/03/2016: Added a Duro-Chrome LDT-22 Long Tappet Wrench. 01/02/2016: Added a Duro-Chrome 1033C Open-End Wrench. 12/27/2015: Added a Duro-Chrome 2055 Offset Box Wrench. 12/17/2015: Added a Riverside 1/2x9/16 Offset Box Wrench. 12/08/2015: Added a ChromeXQuality 1/2x9/16 Offset Box Wrench. 11/08/2015: Minor reorganization, added early notice for Duro Metal. 12/24/2011: Added a Indestro Polygon 5/8x11/16 Offset Box Wrench. 11/27/2011: Added a Duro-Chrome E61 Ignition Wrench. 11/25/2011: Added a ChromeXQuality 3/8x7/16 Offset Box Wrench. 06/11/2011: Added a Super-Quality 713 Box Wrench. 06/02/2011: Added a Indestro "Polygon" 1/2x9/16 Offset Box Wrench. 06/01/2011: Added a Duro-Chrome D-3 Tappet Wrench. 05/29/2011: Added a Indestro 141 Box-End Wrench. 05/28/2011: Added a Indestro 144 Box-End Wrench. 05/27/2011: Added a Indestro 142 Box-End Wrench. 04/13/2011: Added a Super-Quality (X-Circle)  Offset Box Wrench. 03/20/2011: Added a Handy-Hex 02054 Offset Box Wrench. 02/26/2011: Added a Duro-Chrome 2055 Offset Box Wrench. 02/22/2011: Added a Handy-Hex 02056 Offset Box Wrench. 02/21/2011: Added a Duro-Chrome E65 Ignition Wrench. 02/19/2011: Added a Duro-Chrome (X-Circle) 1027C Open-End Wrench. 02/04/2011: Added a Handy-Hex 02053 Offset Box Wrench. 01/28/2011: Added a Duro-Chrome "Handy-Hex" 2062 Box Wrench. 01/15/2011: Added a Duro-Chrome 2087A Adjustable Wrench. 12/18/2010: Added a Handy-Hex 02052 Offset Box Wrench. 12/14/2010: Added a Duro-Chrome (X-Circle) 1725-B Open-End Wrench. 12/13/2010: Added a Duro-Chrome 4535 1/4-Drive Sliding Tee Handle. 12/02/2010: Added a Indestro Super T1A Tappet Wrench. 11/27/2010: Added a Indestro "Chrome Vanadium Steel" 1723 Open-End Wrench and a Super-Quality (X-Circle)  Halfmoon Box Wrench. 11/20/2010: Added a Indestro "Chrome Vanadium Steel" 1721 Open-End Wrench. 11/02/2010: Added a Super-Quality 1721 Open-End Wrench. 10/07/2010: Added a Indestro "Chrome Vanadium Steel" 1033 Open-End Wrench. 10/06/2010: Added a Super-Quality 1731-A Open-End Wrench and an Indestro Super No. 1 Tappet Wrench. 10/05/2010: Added a Super-Quality 1727 Open-End Wrench, a Super-Quality 1027 Open-End Wrench, and a Indestro "Chrome Vanadium Steel" No. 3 Tappet Wrench. 10/02/2010: Reorganized sections, added a Duro-Chrome 1027 Open-End Wrench and Indestro "Chromium Vanadium" 1/2-Drive 12xx Sockets. 10/01/2010: Added a ChromeXQuality 1027 Open-End Wrench. 09/26/2010: Added a Duro-Chrome 2044 Short Offset Box Wrench. 09/24/2010: Added a Indestro 1/2-Drive 13 Inch Speeder. 09/19/2010: Added a Duro-Chrome 663D 1/2-Drive Sliding Tee Handle. 09/18/2010: Added a Duro-Chrome 2052A Offset Box Wrench. 09/13/2010: Added a Cross Country 3/4x7/8 Box Wrench. 09/07/2010: Added a Perfection P-27 Offset Box Wrench. 09/06/2010: Added a Indestro  1/2-Drive Ratchet. 09/05/2010: Added a Duro No. 825 1/2-Drive Socket Set. 09/04/2010: Added a Duro-Chrome 2015A Box Wrench. 09/02/2010: Added a Duro 673 1/2-Hex Drive Ratchet and an Indestro "Chromium Vanadium" 1/2-Drive Socket Set. 09/01/2010: Added a Duro 1/2-Drive Screwdriver Socket. 08/28/2010: Reorganized socket identification section, added a Duro-Bilt "20-Piece" 1/2-Drive Socket Set. 08/26/2010: Added a Duro No. 660 1/2-Drive L-T Ell-Handle. 08/23/2010: Added a Duro 1/2-Drive 8 Inch Extension. 08/22/2010: Added a Duro "Double Guarantee" 1/2-Drive Socket Set, a Duro No. 672 1/2-Drive Ratchet, and Duro Medium Sockets from "Double Guarantee" Set. 08/18/2010: Added a Duro-Chrome 2043 Short Offset Box Wrench. 08/17/2010: Added a Handy-Hex 02081 Half-Moon Box Wrench. 08/15/2010: Added a Duro-Chrome 2042 Short Offset Box Wrench. 08/06/2010: Added a Indestro "Chicago" 1/4x5/16 Box Wrench and a Handy-Hex 02051 Offset Box Wrench. 07/13/2010: Added a Duro-Chrome 1823 Obstruction Wrench. 07/07/2010: Added a Duro-Chrome 2015 Box-End Wrench. 06/30/2010: Added a Super-Quality 1827 Obstruction Wrench. 06/29/2010: Added a Duro 1825 Obstruction Wrench. 06/27/2010: Added information on early Indestro trademark. 04/25/2010: Added a Duro 671 Ratcheting Box Wrench. 09/30/2009: Added a Duro-Chrome 1831 Obstruction Wrench. 09/18/2009: Added a Duro-Chrome 1827 Obstruction Wrench. 09/02/2009: Added a Super-Quality 731 Offset Box Wrench. 08/31/2009: Added a Westline 0725B Open-End Wrench. 08/10/2009: Added a ChromeXQuality 1/2-Drive Flex-Head Handle. 08/09/2009: Added a ChromeXQuality N693 1/2-Drive Socket Set. 06/07/2009: Added a DuroLite 16S6 Screwdriver. 04/15/2009: Added a ChromeXQuality 3/4x7/8 Box-End Wrench. 04/14/2009: Added a Duro-Chrome "G" 1025 Open-End Wrench. 03/26/2009: Added a Duro-Chrome 2017 Box Wrench. 03/07/2009: Added a Duro-Chrome (X-Circle) No. 2 Tappet Wrench. 02/11/2009: Added a Duro-Chrome (X-Circle) 2013 Box Wrench. 02/10/2009: Added a Duro-Chrome 2014A Box Wrench. 01/03/2009: Added a Duro-Chrome (X-Circle) 1034-A Open-End Wrench. 12/30/2008: Added a Indestro Super-Quality 741 Offset Box Wrench. 09/04/2008: Added a Super-Quality  Box-End Wrench. 08/21/2008: Added a Duro-Chrome (X-Circle) 1731-A Open-End Wrench. 08/13/2008: Added a Duro-Chrome 4479 3/8-Drive Flex-Head Breaker Bar. 08/11/2008: Added a Duro-Chrome 2054 Offset Box Wrench. 08/09/2008: Added a Duro-Chrome E67 Ignition Wrench. 08/02/2008: Added a Duro-Chrome (X-Circle) 1028-S Open-End Wrench. 07/29/2008: Added a Duro-Chrome E69 Ignition Wrench. 07/24/2008: Added a Duro-Chrome 86 Ignition Wrench. 07/04/2008: Added a Duro-Chrome 1729 Open-End Wrench. 05/16/2008: Added a Duro-Chrome 2059A Offset Box Wrench. 04/18/2008: Added a Duro-Chrome 662D 1/2-Drive Extension. 04/11/2008: Added a Duro-Chrome 1174 1/2-Drive Impact Socket. 03/30/2008: Added a Indestro Early Nut and Tap Wrench Set. 03/20/2008: Added a Indestro 657 1/2-Drive Ratchet. 03/19/2008: Added a Indestro No. 2104 3/8-Hex Drive Socket Set. 03/16/2008: Added a Indestro 642 1/2-Drive Valve Grinding Adapter. 03/04/2008: Added a Duro-Chrome 1618V8X 1/2-Drive Special Socket. 02/27/2008: Added a Duro-Chrome 2058B Offset Box Wrench. 02/12/2008: Added a Indestro Chicago 739 Offset Box Wrench. 02/07/2008: Added a Duro-Chrome 2100 Waterpump Pliers. 01/29/2008: Added a Duro-Chrome 582 1/2-Drive Extension. 01/22/2008: Added a Indestro 2021-V8 Valve Guide Punch. 01/19/2008: Added a Indestro C-V 3221 1/2-Drive Breaker Bar. 01/01/2008: Added a Riverside Offset Box Wrench. 12/03/2007: Added a Indestro 2161 Brake Adjusting Spoon. 12/02/2007: Added a Duro-Chrome 02036 Early Combination Wrench. 12/01/2007: Added a Indestro Chicago No. 731 Offset Box Wrench. 11/16/2007: Added a Duro-Chrome 02032 Early Combination Wrench. 11/06/2007: Added a Indestro "Klip-Tite" Wrench Set. 10/17/2007: Added a Duro-Chrome E68 Ignition Wrench and a Duro-Chrome 88 Ignition Wrench. 10/14/2007: Added a Duro-Chrome 02035 Early Combination Wrench. 09/11/2007: Added a Duro-Chrome "G" 2011 Box Wrench. 08/21/2007: Added a Indestro Chicago Box Wrench. 07/18/2007: Added a Indestro Super 3221 1/2-Drive Breaker Bar. 07/02/2007: Added a Indestro Super 3202R 1/2-Drive Ratchet. 06/20/2007: Added a Duro-Chrome 02033 Early Combination Wrench. 06/14/2007: Added a Indestro Chicago Box Wrench. 06/06/2007: Added a Chromium Vanadium 3216 1/2-Drive Extension. 05/29/2007: Added a ChromeXQuality N705 Socket Set. 05/28/2007: Added a Indestro Super 368 Flare-Nut Wrench. 05/27/2007: Added a Indestro Super 3208 Speeder. 05/25/2007: Added a Duro Metal Products 652 Speeder. 05/06/2007: Added a Duro 3/4 Speeder Socket Wrench. 05/01/2007: Added a Super-Quality 758A Offset Box Wrench. 04/30/2007: Added a Indestro Super 3289 Long-Handled Ratchet. 04/25/2007: Added Powr-Kraft 1/2-Drive Sockets. 04/24/2007: Added a Duro-Chrome 669D Flex-Head Breaker Bar. 04/16/2007: Added a Duro-Chrome 338 Gland Nut Tee Wrench. 04/06/2007: Added a Duro-Chrome 666D Flex-Head Breaker Bar. 03/22/2007: Added a Indestro No. 410 Drain Plug Wrench. 02/19/2007: Added a Duro-Chrome 2021 Box-End Wrench. 02/17/2007: Added a Duro 617 Socket Wrench. 01/23/2007: Added a Duro-Chrome 2013 Box-End Wrench. 01/19/2007: Split into six pages, added a Duro-Chrome 2061 Short Box-End Wrench. 01/18/2007: Added a Duro-Chrome 2035 Combination Wrench. 01/17/2007: Added a Duro-Chrome 1830 Obstruction Wrench. 01/16/2007: Added a Indestro 3202 1/2-Drive Ratchet. 01/15/2007: Added a Indestro Chicago 731 Open-End Wrench. 01/14/2007: Added a Duro-Chrome 1821 Obstruction Wrench and a Duro-Chrome 2031 Combination Wrench. 01/13/2007: Added a Super-Quality 767 Main Bearing Wrench. 01/12/2007: Added a early Indestro Chicago Open-Box Wrench. 01/11/2007: Added a Indestro Chicago Open-Box Wrench. 01/10/2007: Added a Indestro Chicago 731-A Open-End Wrench. 01/09/2007: Added a Indestro Chicago 25 Open-End Wrench, a Indestro Chicago 729 Open-End Wrench and a Duro-Chrome 2015 Box-End Wrench. 01/08/2007: Added a Indestro Chicago Box Wrench. 01/07/2007: Added a Duro-Chrome 272AB Piston Pin Tool. 01/06/2007: Added a Duro-Chrome 2053 Offset Box-End Wrench. 01/05/2007: Added a Indestro Chicago 721 Open-End Wrench and a Duro-Chrome 2233 Thin Combination Wrench. 01/04/2007: Added a Super-Quality 1827 Obstruction Wrench. 01/03/2007: Added a Indestro 3275 1/2-Drive Ratchet. 01/02/2007: Added a Indestro Double-Socket Wrench. 01/01/2007: Added a Duro-Chrome 1723 Open-End Wrench and a Duro-Chrome D2 Tappet Wrench. 12/31/2006: Added a Duro-Chrome 4575A 1/4-Drive Ratchet. 12/22/2006: Added a Duro-Chrome 2237 Thin Combination Wrench and a Duro-Chrome 4481 Flex-Head Breaker Bar. 12/21/2006: Added a Duro-Chrome (X-Circle) 1731 Open-End Wrench and a Super-Quality 753 Short Box Wrench. 12/20/2006: Added a Duro-Chrome 2042 Short Offset Box Wrench and a Indestro Super 2775 Ratchet. 12/19/2006: Added a Duro-Chrome 648 Battery Tool and a Duro-Chrome 369 Flare-Nut Wrench. 12/18/2006: Added a Duro 600 Socket Wrench, a Duro-Chrome 2014 Box-End Wrench, Duro-Chrome 2115 Pliers, and a Duro-Chrome 1027 Open-End Wrench. 12/17/2006: Added a Duro-Chrome 372 Flare-Nut Wrench. 12/16/2006: Added Duro-Chrome 2120 Steeldraulic Pliers. 12/15/2006: Started reorganizing pages, added a Duro 615 Socket Wrench and Duro 2116 Battery Pliers. 12/11/2006: Added a Indestro Chicago 733 Offset Box Wrench. 12/04/2006: Added a Duro-Chrome D-1 Tappet Wrench and a Duro-Chrome 675 Ratchet. 11/30/2006: Added Indestro Super 775 Thin Combination Wrench. 11/27/2006: Added Duro-Chrome 2234 Thin Combination Wrench and a Duro-Chrome 657DK Flex-Head Breaker Bar. 11/26/2006: Added Duro-Chrome 34x 1/4 Male Drive Sockets. 11/25/2006: Added a Duro-Chrome 382 Offset Flare Wrench and a Duro-Chrome 384 Offset Flare Wrench. 11/22/2006: Added a Duro-Chrome 381 Offset Flare Wrench, Duro-Chrome 383 Offset Flare Wrench, and a Duro-Chrome 4490 Refrigeration Ratchet. 11/21/2006: New refrigeration section, added a Duro-Chrome 371 Flare Wrench. 11/20/2006: Added an Indestro Nut and Tap Wrench Set. 11/08/2006: Added an Indestro Polygon Offset Box-End Wrench. 11/01/2006: Added a Indestro Super 731A Offset Box-End Wrench. 10/17/2006: Added a ChromeXQuality Box-End Wrench. 10/16/2006: Added a Duro-Chrome 2037 Combination Wrench. 10/10/2006: Added a Duro L-T Handle. 10/07/2006: Added a Duro-Bilt Socket Set. 09/26/2006: Added a Early Duro LTX316 Socket Set. 09/01/2006: Info on the transition date to the Indestro Super mark, added an Indestro 2 Tappet Wrench. 08/28/2006: Added a Duro-Chrome 4487 Ratchet. 08/27/2006: Added examples to patent table. 08/21/2006: Added a Indestro 763 S-Shaped Wrench and a ChromeXQuality 3/4x25/32 Box-End Wrench. 08/20/2006: Added a ChromeXQuality 15/16x1 Box-End Wrench. 08/18/2006: Added a ChromeXQuality 5/8x11/16 Box-End Wrench. 08/14/2006: Added a Duro-Chrome 678D Ratchet and an Indestro 3201 Ratchet. 08/08/2006: Added a Handy-Hex 02054 Box-End Wrench. 07/04/2006: Added a Duro Convertible T-L Handle. 06/25/2006: Added a 1931 Indestro "Chromium Vanadium" Socket Set. 06/05/2006: Added a ChromeXQuality Breaker Bar. 05/26/2006: Updated company history to note sales to Sears Roebuck, Montgomery Ward, and Western Auto. 05/20/2006: Added Early Duro-Chrome 16xx Sockets. 03/27/2006: Added a Cross Country No. 3 Tappet Wrench. 03/10/2006: Added a Cross Country 1831 Wrench. 02/26/2006: Added a Westcraft HR2820 Breaker Bar. 02/11/2006: Added a Duro-Chrome 2081 "Elbow" Wrench. 01/30/2006: Added new Handy-Hex tool Handy-Hex 02072. 01/21/2006: Added new section on Contract Production. 01/14/2006: Added section on Drain Plug Sockets. 12/17/2005: Added patent D119,441 to patent table. 11/28/2005: Updated text for recently acquired 1939 Duro and 1941 Indestro catalogs. 10/11/2005: Added a photo of an Indestro socket set with D-I sockets; minor edits. 10/08/2005: Added Duro-Chrome 2015A with X-Circle logo. 09/29/2005: Split into multiple pages for faster loading, flow text around figures. 09/26/2005: Added patent #2363350 to Table 1. Duro Metal Products and Indestro Manufacturing were two companies with common management that were important makers of hand tools during the middle part of the 20th century. In this article we'll look at the company history and their extensive patent and trademark activities, discuss the somewhat complicated issues of tool identification, and of course show lots of examples of their tools. Before examining the history of Duro Metal Products and Indestro Manufacturing, we first need to clarify the relationship between the two companies. A casual observer might at first think that Duro and Indestro were unrelated businesses, but on closer examination Duro and Indestro look and behave more like a single company, with a dual organization set up to promote the branding of their products. For example, both companies listed their headquarters at the same address, 2649 North Kildare Avenue in Chicago, and both companies' catalogs show the same two illustrations of their factory buildings. Numerous items in the Duro catalogs were actually products branded Indestro, and Indestro products often listed patents granted to Duro Metal Products. The Indestro catalogs show most of the same products as the Duro catalogs, but with different model numbers assigned to the Indestro pieces. From these considerations, for our present purpose Duro and Indestro can be treated as a single company with two major product brands. In fact, it appears that the main reason for Indestro may have been to allow production of inexpensive or economy lines of tools, without diluting the high-end reputation of the Duro products. Although Duro and Indestro acted in concert for most of their history, the companies began separately and with very different products, then began to converge as each evolved into a tool company. For a period in the late 1920s and early 1930s, Duro and Indestro would have been fairly direct competitors, as each sought business from major retailers like Sears Roebuck and Western Auto Supply. Based on our historical findings, the companies finally joined forces in mid 1933, and afterwards became a potent force in the tool industry. With the above in mind, Duro Metal Products was founded in 1916 by Norris F. McNaught and William H. Odlum, both of whom would play an active role in product development for many years. The words "metal products" in the company name leave open the possibility of a wide range of products, as the reader will see from the description of Duro's early products. One of Duro's earliest products was the Lilly Hoist Controller, a mechanical and electrical controller for use on safety hoists in mines. Based on notices in trade journals, the Lilly equipment was being offered by 1919 and remained in production for a number of years. Duro Metal is noted as attending some trade conferences for mining equipment during this period. The controller was based on patent 1,153,124, issued to William J. Lilly on September 7, 1915. Fig. 1A shows a catalog listing published in the 1921 edition of The Mining Catalog, providing an illustration and description of the Lilly hoist controller. The company's address is listed as 361 East Ohio Street in Chicago. Another of Duro's early products was quite different: a set of stencils for doing hand lettering. Fig. 1B shows a notice describing the "Lilly Letterograph" stencil set, as published on page 13 of the September 14, 1922 issue of Geyer's Stationer. This notice gives the company address as 360 East Grand Street in Chicago. The seeming discrepancy in the company's address can be explained by noting that East Ohio and East Grand streets run parallel one block apart, so that a large building could have an address on each street. Advertisements for the Lilly Letterograph appeared in some issues of Popular Mechanics beginning in August, 1922. Fig. 1C. Illustration of Duro Metal Products Factory. A notice on page 883 of the December 7, 1923 issue of Sheet Metal Worker states that Duro Metal Products had awarded a contract for a new building. The company address was given as 2649 North Kildare Avenue in Chicago, the address that Duro Metal (and later Indestro) would occupy for many years. The scan in Fig. 1C shows an illustration of Duro's factory, as found on page 1 of the 1935 Duro catalog. If the two products noted above provide little indication of Duro Metal becoming a leading tool company, the origin of Indestro Manufacturing will seem even more improbable. According to information discovered in trademark applications, Indestro actually began as the maker of a bottle-capping machine! Fig. 1. Early Sure Seal Bottle Capper Logo, ca. 1920s. An early logo found on a wrench set provides an interesting (and unexpected) view of the origin of the Indestro brand and company. Fig. 1 shows the detail from an early Indestro nut and tap wrench set, marked "Sure Seal Bottle Capper Co." and "Chicago" around the outside, with "Mfrs. Indestro Products" in the center. This suggests that the Sure Seal Bottle Capper Company was the earlier entity using the Indestro mark, and that bottle-cappers were an important early product. Several patents for bottle-cappers were issued to Harold G. Rice before and after 1920, and some of the later patents were assigned to Indestro. Additional research has confirmed that the Sure Seal entity was the originator of the Indestro mark. A trademark search found that the Sure Seal Bottle Capper Company filed an application on September 10, 1921 for an "Indestro All Steel Capper" mark in a graphic design. The trademark was issued as #156,066 on June 13, 1922, with the first use date listed as January 20, 1921. Fig. 2. Indestro All Steel Capper Logo, 1922. Fig. 2 at the left shows the graphic design included in the trademark application. The information from the trademark application shows that the Sure Seal Bottle Capper Company was using the Indestro brand during the early 1920s, and that the trademark was used on bottle-capping machines. The trademark application noted that the Sure Seal company was a copartnership of Harold G. Rice, Louis M. Rice, and Landor Penne. Two of the partners are listed in the notice below, found on page 1161 of the 1923 Certified List of Domestic and Foreign Corporations, published by the Illinois Secretary of State. Fig. 2A. shows the Sure Seal Bottle Capper Company at 552 West Harrison Street in Chicago, with the officers listed as L. Penne (living in Oregon) and H.G. Rice. The capital was listed as $10,000. By 1926 there are references in trade publications to an Indestro Manufacturing Company in Chicago, and a 1928 notice gives its address as 2650 Coyne Avenue, and mentions H.G. Rice as the president. These notices show that by the mid 1920s Indestro Manufacturing had become the successor to the Sure Seal Bottle Capper Company. Furthermore, a 1928 notice on page 386 of Volume 122 of Iron Age lists Indestro Manufacturing at 2650 Coyne Avenue as a maker of universal joints, valve lifters, and other tools, showing that Indestro had become a tool company by this time. The piecemeal discoveries in the previous two paragraphs are neatly corroborated by the recently discovered document for trademark #229,445. The application was filed on March 13, 1926 by the Indestro Manufacturing Company and states that the mark "Indestro" was being used on a variety of tools, including nut wrench sets, socket wrench sets, ratchets, universal joints, valve lifters, and others. The company address was listed as 2650 Coyne Avenue in Chicago, the application was signed by H.G. Rice as president, and it even mentions the former operations as the Sure Seal Bottle Capper Company. Fig. 2B. 1928 Catalog Listing for Indestro No. 600 Socket Set. Fig. 2B shows a catalog listing for an early Indestro socket set, found on page 10 of the 1928 McMaster-Carr "Industrial Merchandise" catalog. The contents of the set included a ratchet, an "L & T" handle, two speeders, two universals, extensions, 19 hex sockets, and 8 square sockets, all for the bargain price of $4.95. A careful look at the illustration shows an odd mix of hexagonal and square drive pieces, including an adapter from hex to square drive. The L & T handle and the ratchet definitely are hex drive, but the presence of adapters suggests that some of the sockets could have been square drive. Note that although the illustration of the L & T handle looks a lot like the Hinsdale TL-1 Convertible Handle, it's actually the recently (2019) discovered Indestro T-L Tee and Ell-Handle. This is one of the earliest known catalog listings for Indestro products. By 1929 Indestro had moved again, this time to 3429 West 47th Street. The 1929 Certified List of Domestic and Foreign Corporations, published by the Illinois Secretary of State, lists the company at this address, and the 1930 Blue Book of Chicago Commerce confirms the address. The latter publication lists the company's products as socket wrenches, auto tool kits, polishing grinders, valve lifters, and a number of other tools, plus their original bottle cappers. The move to West 47th street put Indestro practically next door to Sherman-Klove, at that time a contract manufacturer of screw machine products. What's missing from the public notices found so far is information on when Duro Metal Products and Indestro Manufacturing came to have common ownership. Our original assumption was that Duro Metal Products had acquired Indestro Manufacturing sometime in the early to mid 1920s, but given that the companies had separate addresses as late as 1930, the ownership change probably came in the early 1930s. We have found some clues in the public record. The 1934 Certified List of Domestic and Foreign Corporations lists both Norris F. McNaught and William H. Odlum with the entry for Indestro Manufacturing. In addition, the 1937 trademark application for the "streamlined" mark (#346,439) was signed by Norris F. McNaught as president. A more subtle clue to the ownership change can be gleaned from the patent records. Harold G. Rice, the founder of Indestro, had a number of patents pending in 1932 and 1933, in particular #1,869,945, #1,904,328, and #1,912,725. Patents #1,869,945 and #1,904,328, issued on August 2, 1932 and April 16, 1933 respectively, both listed Rice as the assignor to Indestro Manufacturing. But patent #1,912,725, issued on June 6 of 1933, lists Rice as assignor by mesne assignments to Indestro Manufacturing [emphasis added]. In property law "mesne assignment" is a term meaning an assignment that passes through an intermediary. In the context here, this means that by June 6, 1933 Harold Rice had already assigned his rights to the pending patent, presumably to the new owners of Indestro Manufacturing. This provides further strong evidence of the ownership change, and narrows the date of the transfer to sometime between April 16 and June 6 of 1933. Barring further information to the contrary, we'll use mid 1933 as the date that the two companies joined forces. Putting aside the question of ownership for the moment, let's try to fill in some details on Duro's transformation into a tool company. Unfortunately we're hampered by a lack of catalogs or advertisements covering the mid to late 1920s, but in 1929 and 1930 Duro socket sets started appearing in the Sears Roebuck catalogs. The Duro sets sold by Sears show a high degree of mastery of the relevant manufacturing technologies, including screw machine operations, metal forming and bending, and metal stamping for the cases. In late 1929 Duro filed an application for the "Duro-Bilt" trademark, with the first use given as October 12, 1929. The application listed the covered products as socket wrenches, socket wrench kits, valve reamers, and valve-grinding machines. The trademark application is consistent with the noted Sears activity, and we have two examples of Duro-Bilt socket sets that were probably sold through Sears. In the absence of catalog resources, we can get a good handle on Duro's activities in the late 1920s by looking into their patent filings. When we look at the Duro Patents, we see a flurry of patent filings from 1927 to 1929, all related to automotive service tools. There are patents for reciprocating valve grinders (#1,749,300, #1,751,657), lever action ratchets (#1,798,481, #1,798,482), a convertible L-T handle (#1,744,413), and a socket kit holder (#1,788,535). All of these represent tools that would have been high demand at the time, and some of them show that Duro was looking closely at the activities of competitors like Hinsdale Manufacturing. For example, the L-T handle and lever action ratchets were basically knock-offs of Hinsdale designs, although possibly with improvements. The patent and trademark records demonstrate that Duro was following a path similar to Indestro, so that both Duro Metal Products and Indestro Manufacturing were producing tools for the automotive service market by the late 1920s. Their early products included such items as hex-drive socket sets, 1/2 square drive socket sets, fixed socket wrenches, and specialty tools. (Indestro also produced a variety of other products, including bottle-cappers and kitchen utensils such as egg-beaters.) Examples of their early tool production can be seen in the Duro 634 Socket Wrench and Indestro Socket Wrench. By the early 1930s the two companies, although still operating separately, were both actively developing and marketing products for the growing automotive service market. Many patents were granted to Duro Metal Products during this period, covering both new product designs and better ways of producing existing items. By the time the 1939 Duro-Chrome catalog (#39M) was issued, the companies were offering a broad line of tools with both high-end and economy selections. During the 1930s, Duro and Indestro were suppliers to at least three major retailers: Sears Roebuck, Western Auto Supply, and Montgomery Ward. The tools supplied included socket sets, drive tools, and wrenches, and were sold both under existing Duro or Indestro brands, as well as private brands produced for the particular retailer. The paragraphs below will provide some examples of these supplier arrangements. Indestro had found early success as a supplier to Western Auto Supply and had provided hex-drive socket sets (and possibly other tools) as early as 1926. By 1931 Indestro was also supplying alloy steel tools to Western Auto, as an Indestro "Chromium Vanadium" 17-Piece Socket Set was acquired with a Western Auto receipt dated in 1931. Indestro also supplied 1/2-drive carbon-steel socket sets to Western Auto, such as the 47-piece and 36-piece sets illustrated with Indestro's T-L handle in the 1932 catalog. Duro was supplying valve grinders to Western Auto by 1929, and by 1932 Duro was providing "Perfection" offset box-end wrenches for the "Chromium Vanadium" line, in direct competition with Herbrand's "Multi-Hex" wrenches. By 1933 Duro was probably supplying knock-offs of Herbrand's "Obstructo" obstruction wrenches as well. The ability to compete head-on with Herbrand, on old-line merchant drop-forging company, is strong evidence for Duro's in-house drop-forging capabilities. The Western Auto catalogs show that the Duro-Indestro merger in 1933 was quickly reflected in their tool production. The 1933 Western Auto (Eastern edition) catalog (copyright in 1933, so presumably published sometime in that year) lists an Indestro chrome-vanadium 17-piece socket set, with a Duro pressed-flange ratchet replacing the Indestro ratchet adapter supplied in the previous year. In addition, the 47-piece and 36-piece economy socket sets are shown with a Duro lever-action ratchet and L-T handle, replacing the Indestro Lever-Action Ratchet and Indestro T-L Handle that had been illustrated in the previous year. Later in the 1930s, Duro/Indestro was a major producer for Western Auto's ChromeXQuality line, and continued to supply products for the later Wizard and Westcraft tool lines. For Montgomery Ward, Duro/Indestro produced sockets and wrenches for the company's "Riverside" line, and some examples of these tools will be shown in a later Riverside section. A 1935 Montgomery Ward catalog shows a 35-piece chrome-vanadium steel socket set in a toolbox for $8.45; the set can be recognized as Duro production by the socket design and the pressed-flange construction of the ratchet. Also offered are chrome-vanadium box-end wrenches and an older 36-piece carbon-steel socket set for just $2.69. In May of 1935 Duro filed for an important patent on their new hot-broaching method for making sockets, and the patent was issued as #2,027,922 in January of 1936. The patent document has an excellent discussion of the prior art (cold-broaching) and the advantages of hot-broaching, and is highly recommended for anyone interested in the how and why of such things. Among the advantages cited are the increased strength of the sockets, the smooth broach free of chatter marks, and the relieved lip at the drive end that allows for easier connection to a drive tool. Duro was relatively early in adopting the hot-broaching process for socket production, which would eventually become standard for the industry. Duro and Indestro continued to prosper during the 1940s and '50s, but by the 1960s appeared to be losing ground to other competitors. Sometime during the '60s the Indestro operations were formally merged into Duro Metal Products, and the tools began appearing with dual brands "Duro-Indestro". The tool lines were "harmonized", which unfortunately meant that some of the special higher-end features of the Duro-Chrome tools were dropped. The company continued operating through the 1970s and 1980s, and was finally closed in 1990. Duro Metal Products devoted substantial resources to research and development activities, as evidenced by the numerous patents issued to the company. Most of the patents obtained were assigned to the Duro Metal Products entity, but a few listed Indestro Manufacturing as the assignee. In some cases the company licensed patents from outside the company. The table below lists some of the known patents issued to Duro or Indestro, or patents used by the companies and assumed to have been licensed. The list may not be complete, but will be expanded if new patents are found. Many of the tools produced by Duro and Indestro were marked with one of their well-known registered trademarks, and these of course are easy to identify. However, the companies also used a number of informal and unregistered marks for their tools, and these will be described (to the extent they are known) in the sections below. First though, let's review the registered trademarks, using information obtained from the USPTO database. Sure Seal 01/20/1921 09/10/1921 06/13/1922 156,066 Sure Seal Bottle Capper Co.
Indestro 12/30/1936 01/18/1937 05/25/1937 346,439 Norris F. McNaught, President. 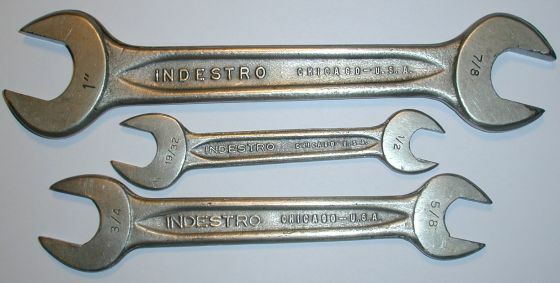 In early 1937 Indestro filed an application for an important trademark, the "streamlined" design for its wrenches, and listed December 30, 1936 as the date of first use. The registration was issued as #346,439 later that year. The trademark application shows the design as a dart-like elongated oval, with the illustration placing it within the outline of an open-end wrench as an example. This trademark is notable in that it doesn't depend on any specific wording, but only on the design itself, so that any wrench made with this distinctive design could still be regarded as marked by Indestro. This would have allowed the company to make tools with the specific "Indestro" branding omitted from the forging, so that the finished tools could be marked with private brands as needed. Fig. 3. Indestro Chicago Double-Open Wrenches Showing Streamlined Design. In these examples the streamlined design takes the form of depressed panels with pointed darts at the end, and the width of the panels follows the natural shape of the shank. The streamlined design also appears as raised panels with darts on other wrench models. Duro and Indestro tools were generally not marked with a date code or other specific indication of the manufacturing date. When estimates of manufacturing dates are needed, they must be based on factors such as marking style, design, patents, trademarks, or other characteristics. In order to assist with estimating manufacturing dates, we hope to develop some guidelines based on tool markings and other characteristics. For now, the following list of events and observations may be helpful in determining the manufacturing date for some tools. Duro-Bilt Trademark. The Duro-Bilt trademark was first used in 1929. Duro-Chrome Trademark. The Duro-Chrome trademark was first used in 1931. "Chromium-Vanadium" Marking. From 1931 into the mid 1930s Western Auto Supply used "Chromium-Vanadium" (with the full element names) as a brand for alloy steel tools. Suppliers to Western Auto (which included Duro and Indestro) accordingly used this marking on tools intended for sale to Western Auto. The approximate period of use was 1931 to 1936. However, Indestro sockets continued to be marked "Chromium Vanadium" even after the product line was called "Super Quality". "Handy-Hex" Marking. From the early 1930s until around 1936 Duro used the "Handy-Hex" brand for its box-end wrenches. Super Quality Brand. Indestro began using "Super Quality" as a brand in 1935 or earlier. Some examples are known on box wrenches without streamlined raised panels, confirming that the start date occurred before 1937. Streamlined Design Trademark. The "Streamlined" design, a dart-like depressed or raised panel, was first used in 1937. Specific Alloy Marking. During the 1930s and early 1940s Duro and Indestro alloy steel tools were generally marked for the specific steel composition, usually as "Chrome Vanadium" or "Chrome Vanadium Steel". A review of tools made during 1942-1945 wartime years indicates that specific alloy markings were sometimes used during the earlier part (roughly 1942-1943) part of this period, but generally omitted during the later 1943-1945 years. A further review of Indestro Super tools (made in 1946 and later) shows that the alloy composition was no longer being marked by this time. Thus the use of a specific alloy marking strongly suggests production in 1943 or earlier. Plain Finish. Most Duro/Indestro tools were specified with nickel or chrome plating as the standard finish, but during the 1942-1945 wartime years cadmium or plain finishes became standard. The presence of a cadmium or plain finish (barring extensive rust) suggests production during 1942-1945. X-Circle Marking. During the wartime years Duro/Indestro did extensive production for government contracts, and the tools made for these contracts were frequently marked with a symbol resembling an "X" in a circle, referred to as the X-Circle mark in the text. (See the section on X-Circle for more information.) The use of this mark appears to have been adopted during the middle of the wartime period, so that the presence of the X-Circle mark suggests production in 1943-1945. "G" Code. A small number of Duro-Chrome tools have been found with a "G" code stamped near the brand or model number, typically with a plain finish. This "G" code is believed to indicate production in 1945 under government restrictions, similar to the use by Snap-on of "G" as its date code for 1945. "Indestro Super" Brand. The Indestro Super brand was first used in late 1945 or 1946, as a successor to the "Super-Quality" brand previously used for alloy-steel tools. The photographs and observations in this article are based on items in the Alloy Artifacts Collection. Information on the company history was obtained from an obituary for Gertrude McNaught Odlum in the January 23, 1992 edition of the Chicago Tribune. Product information was obtained from a number of Duro Metal Products and Indestro Manufacturing catalogs, which have been summarized in the table below. In some cases the publication year may be approximate, as the catalogs were sometimes undated and furnished with separate price sheets. Duro 1935 Full "Handy-Twin-Hex" box wrenches of C-V steel, Handy-Hex model numbers. Duro-Chrome open-end, tappet, and obstruction wrenches. Duro-Chrome socket sets in 1/4, 3/8, 1/2, and 3/4-drive. Some 1/2-drive carbon-steel socket sets, but no 1/2-hex drive tools. Substantial selection of fender and body tools available. Indestro 1935 Full "Super Quality" C-V open, tappet, obstruction, and box wrenches. "Super Quality" C-V socket sets in 1/4, 3/8, and 1/2-drive. Pressed-flange ratchet No. 3202 available. Lists both Indestro and Duro versions of the L-T convertible handle. Carbon-steel socket sets in 1/4-hex, 3/8-hex, and 1/2-hex drive, 12-point. Carbon-steel socket sets in 1/2-drive, 12-point. Indestro 1937 Full "Super Quality" C-V open, tappet, obstruction, and box wrenches. "Super Quality" C-V socket sets in 1/4, 1/2, and 3/4-drive. "Special Alloy Steel" open+box, open-end, and angled box wrenches. Extensive listings for carbon-manganese 1/2-drive socket sets. Duro 38M 1938 Mini Duro-Chrome box-end wrenches illustrated with streamlined panels. Duro-Chrome socket sets in 1/4, 3/8, 1/2, 3/4, and 1 inch drive. Indestro 1938 Full "Super Quality" C-V open, tappet, obstruction, and box wrenches. C-V wrenches with cadmium (or unpolished) finish also available. "Super Quality" C-V socket sets in 1/4, 1/2, and 3/4-drive sizes. "Special Alloy Steel" offset box, angled box, open, and open+box wrenches. Extensive listings for 1/4-hex, 3/8-hex, and 1/2-hex drive socket sets. Duro 1939 Full Duro-Chrome socket sets in 1/4, 3/8, 1/2, 3/4, and 1 inch drive. Includes flex-box wrenches in standard and millimeter sizes. Includes "Select Steel" offset box wrenches in 8xx series. Includes 6 pages of carbon-manganese socket sets and tools. Includes 1/4-hex, 3/8-hex, and 1/2-hex drive socket sets. Indestro 1939 Full "Super Quality" C-V open, tappet, obstruction, and box wrenches. "Select Steel" offset box, angled box, open, and open+box wrenches. Duro 1941 Full Duro-Chrome socket sets in 1/4, 3/8, 1/2, 3/4, and 1 inch drive. Combination wrenches in both "Dart" and Thin style. "Select Steel" offset box wrenches in 8xx series. "Select Steel" (old carbon-manganese) socket sets in 1/2-drive. "Select Steel" 1/4-hex, 3/8-hex, and 1/2-hex drive socket sets. Indestro 1941 Full "Super Quality" C-V open, tappet, obstruction, and box wrenches. Duro and Indestro products were also available from selected industrial suppliers and from high-volume retailers, including Sears Roebuck, Montgomery Ward, and Western Auto Supply. The Western Auto catalogs listed Duro and Indestro alloy steel tools under the "Chromium-Vanadium" brand in earlier catalogs, and Duro/Indestro later provided extensive contract production for Western Auto brands. Western Auto Supply 1926. The 1926 Ford Owners' Supply Book (Eastern edition) catalog from Western Auto Supply lists an Indestro No. 19 Socket Set on page 114. The set is listed as a "Utility Socket Wrench Set" and the maker is not identified, but the clever wrench set holder matches a patent by H.G. Rice. This is currently our earliest known catalog listing for an Indestro tool. Western Auto Supply 1927. The 1927 Auto Owners' Supply Book (Eastern edition) from Western Auto Supply lists an Indestro No. 19 "Dreadnaught" socket wrench set on page 114. The maker is not identified, but the clever wrench set holder matches a patent by H.G. Rice. McMaster-Carr 1928. The 1928 "Industrial Merchandise" catalog No. 28 from the McMaster-Carr Supply Company offered the Indestro No. 600 "Socket Wrench Set", a 38-piece collection including a ratchet, two speeders, T-L Convertible Handle, 19 hex sockets, eight square sockets, and miscellaneous attachments. The price was $4.95 net. This is one of the earliest known catalog listings for an Indestro socket set. Sears Roebuck 1929. The 1929 Sears Roebuck (Fall-Winter) catalog No. 159 lists several socket sets recognizable as Duro on pages 598-599, including a 25-piece set matching the Duro No. 825 Socket Set. Page 1122 lists five more sets under the "Merit" brand that can be recognized as Duro production by the L-T handle in the illustration. Western Auto Supply 1929. The 1929 Auto Supplies for All Cars (Western edition) catalog lists a Duro valve grinder, the first known listing for a Duro product from Western Auto. Sears Roebuck 1930. The 1930 Sears Roebuck (Spring-Summer) catalog No. 160 lists five "DuroBilt" socket sets on page 402 of the automotive section, including a 35-piece set matching the Duro-Bilt 36-Piece Wrench Set. In addition, the description of a 20-piece set matches the Duro-Bilt 20-Piece Socket Set. Western Auto Supply 1930. The 1930 Auto Supplies for All Cars (Western edition) catalog lists a Duro valve grinder. Sears Roebuck 1931. The 1931 Sears Roebuck (Spring-Summer) catalog lists several Duro socket sets under the Duro-Bilt brand, including a "Super DuroBilt" 40-piece set with chrome-nickel sockets, making this our earliest reference for a Duro alloy steel socket set. Other Duro sets include the Duro-Bilt 36-Piece Wrench Set and Duro-Bilt 20-Piece Socket Set. Western Auto Supply 1931. The 1931 Western Auto (Eastern edition) catalog shows a "Chromium-Vanadium" socket set matching the Indestro CV 17-Piece Socket Set shown here. This is our earliest listing for an Indestro alloy-steel socket set. J&R Motor Supply 1932. The 1932 J&R Motor Supply catalog lists a number of Duro socket sets on pages 72 and 73, with the Duro name or logo visible in the illustration. The sets include the LTX316 1/2-Hex Drive Socket Set and five other carbon-steel sets on page 72, plus two chrome-nickel socket sets on page 73. Sears Roebuck 1932. The 1932 Sears Roebuck (Fall-Winter) catalog No. 165 lists several socket sets recognizable as Duro production on page 539 of the automotive section. A 27-piece "Super Chrome Vanadium Steel Wrench Set" with 12-point ("Twin Hex") sockets can be recognized as Duro production by the forged body pressed-flange ratchet, with the description noting that no rivets or bolts were used in the ratchet. This is our earliest catalog listing for the pressed-flange ratchet. The set was priced at $6.95 postpaid. Also listed are two Duro-Bilt sets, a 40-piece economy set with 6-point sockets for $3.38 postpaid, and a 40-piece "Chrome Nickel Steel" set with 12-point sockets for $6.35 postpaid. Western Auto Supply 1932. The 1932 Western Auto (Eastern edition) catalog shows a "Chromium-Vanadium" socket set matching the Indestro CV 17-Piece Socket Set shown here. The catalog also lists carbon-steel 47-piece and 36-piece socket sets with the Indestro Lever-Action Ratchet and Indestro T-L Handle illustrated. Ducommun "H" 1933. The 1933 catalog "H" from the Ducommun Corporation, a west-coast industrial supplier, lists several Duro socket sets on pages 144E and 144F. The sets include a 1/2-hex drive No. 500 socket set, a 1/2-drive LT911 socket set similar to the LTX316 socket set shown here, and a 1/2-drive 820FA socket set. Sears Roebuck 1933. The 1933 Sears Roebuck (Fall-Winter) catalog No. 167 lists a 27-piece "Chrome Vanadium Steel" set on page 496 under the "Cross Country" brand. The set can be recognized as Duro production by the forged body pressed-flange ratchet and includes 12-point ("Twin Hex") sockets. This set appears to be same 27-piece set listed in the 1932 Sears catalog. Western Auto Supply 1933. The 1933 Auto Owners' Supply Book (Eastern edition) catalog shows a chrome-vanadium socket set with a pressed-flange ratchet matching the Indestro 17-piece "Chromium Vanadium" set in previous catalogs. This shows the transition from an Indestro ratchet adapter to the Duro patented pressed-flange ratchet after the companies had merged. The catalog also lists carbon-steel 47-piece, 36-piece, and 18-piece socket sets with the Duro lever-action ratchet and Duro L-T handle, instead of the Indestro Lever-Action Ratchet and Indestro T-L Handle illustrated in the previous year. Western Auto Supply 1936. The 1936 Auto Owners' Thrift Book (Eastern edition) catalog lists four models of "ChromeXQuality" 1/2-drive socket sets recognizable as Duro/Indestro production. This is the first publication to use the ChromeXQuality brand. Western Auto Supply 1937. The 1937 Western Auto's Thrift Book (Eastern edition) catalog shows a number of listings for the ChromeXQuality brand, including four models of 1/2-drive socket sets readily recognizable as Duro/Indestro production. (This is the publication that allowed us to identify ChromeXQuality as a Western Auto brand.) In addition, the 1937 Auto Supplies (Western edition) catalog offers two models of "ChromeXQuality" 1/2-drive socket sets recognizable as Duro/Indestro production, as well as ChromeXQuality socket sets by other unknown makers.